Oh Terri, LOVE your new addition. The color, shape, and interior are so beautiful. AND WOW your book like a fun read also. 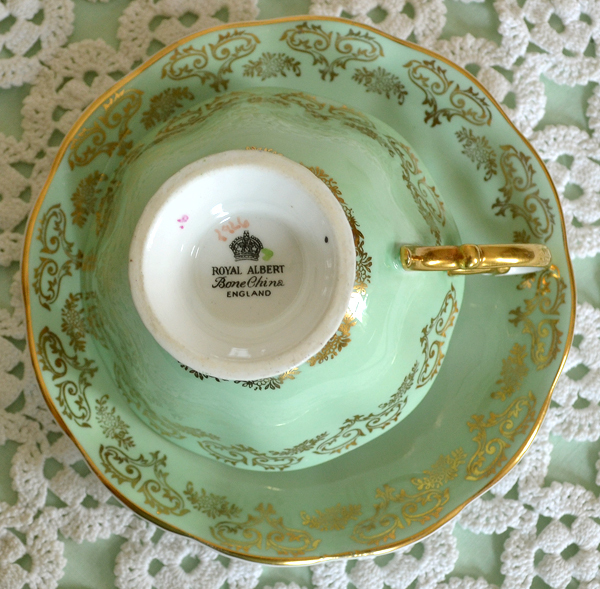 What a stunning cup and saucer and in my favourite Royal Albert! Such a stunning colour which goes so beautifully with the gold. Oh what a stunning cup and saucer. My favourite colour too. Pretty as a picture. Bet the tea tasted so lovely too. I love this post. Tea & books what a wonderful combination. Gorgeous tea cup and your photo editing is awsome. A cup of tea always gives me comfort, a time to rest and most of all something to enjoy any time any where. What a luck for you, to just have a look, and then come home with this beauty, dear Terri. I am also so in love with the colour and that sweet golden patterns on the outside, and whom (of us) can get too many beautifull flower bouquets on our cups :-) Not me! Wish you a happy day, with your new cup ,tea, and a cosy hour with both. Your new teacup is divine! 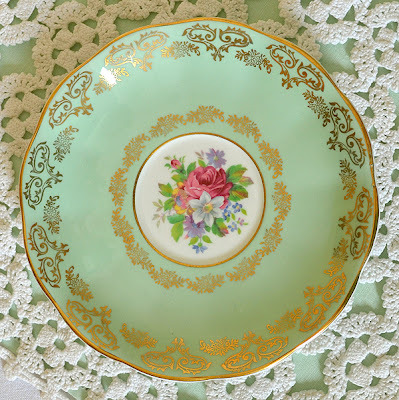 Royal Albert is one of my favorites. Your book looks very interesting. Happy Tea Day! isn't it like having birthday when you find such a treasure. The cup is sooooo beautiful. Love the soft aqua color, the luxury gold trimming and the flower bouquet inside. It confirms my meaning - Royal Albert has the nicest cups. Thank you for sharing your new find and for hosting this event. 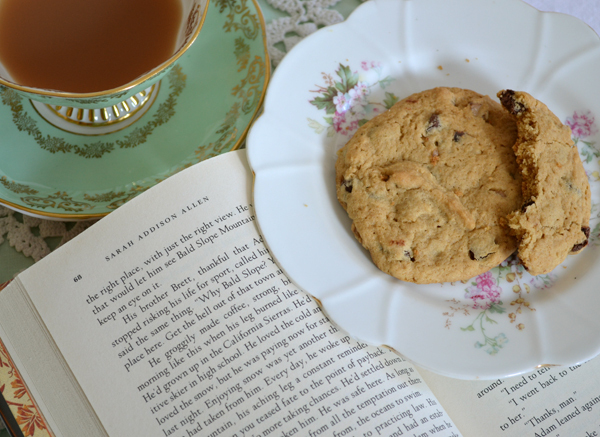 Tea and a good book...and also some delicious cookies ;)... are a perfect association! 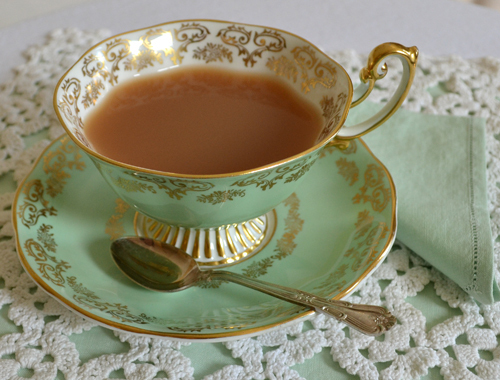 But with the help of such a gorgeous tea cup, things get much much better! Terri, I love your new teacup and the beauty found inside! Great find. Oh Terri, that cup takes my breath away! I guessed it was an Ansley and was surprised to see it wasn't. It is Gorgeous! I will look at this post again and again. Just looked at the teacup again. I didn't notice how sweet those little stripes are that the cup is perched on. I love your new teacup. It is so pretty inside and out. have a lovely day. 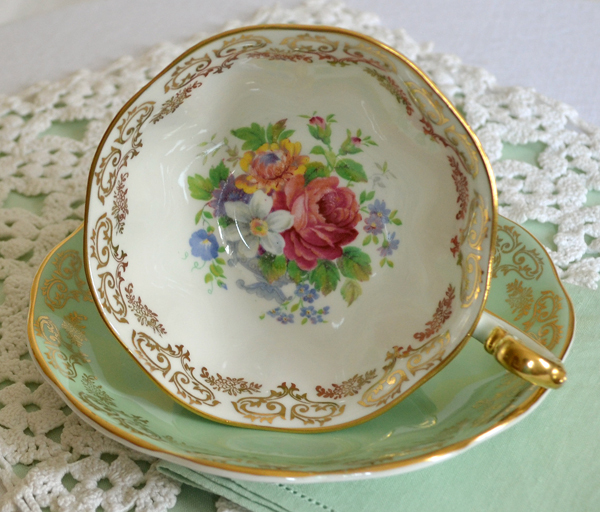 What a stunning teacup, Terri! She's lovely inside and out. I love the green. Thanks for sharing and have a delightful day. What a beautiful teacup! Love the sweet flowers inside the cup and the color is lovely. Your book looks interesting. I may have to go to the library! Thank you for hosting your party and have a wonderful week. WOW! Royal Albert is going to be my new favorite. This tea cup and saucer has so much style! I know she must make you feel very special. How could she not. The color is breath taking and her design is not only classy on the outside, but very sweet and delicate on the inside. Beautiful, BEAUTIFUL set. I'm so excited! I'm learning so much from you wonderful ladies about tea sets! A cup of tea and a good book - nothing better. 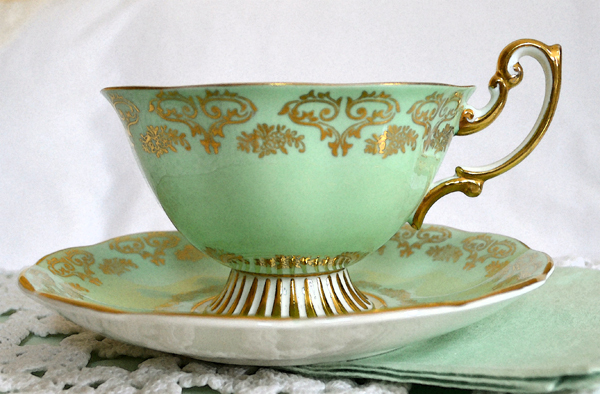 :-) Your new Royal Albert teacup is gorgeous - I love the color and the shape. 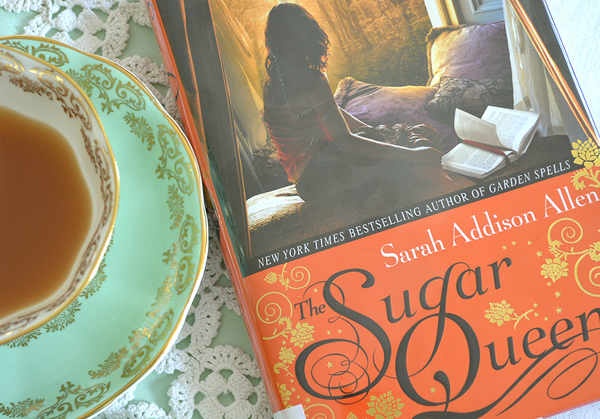 The Sugar Queen does sound like a fun book, at least from the reviews I've read. Royal Albert is quickly becoming my favourite...this is such an exquisite colour. Thanks again for the chance to share 'tea'. 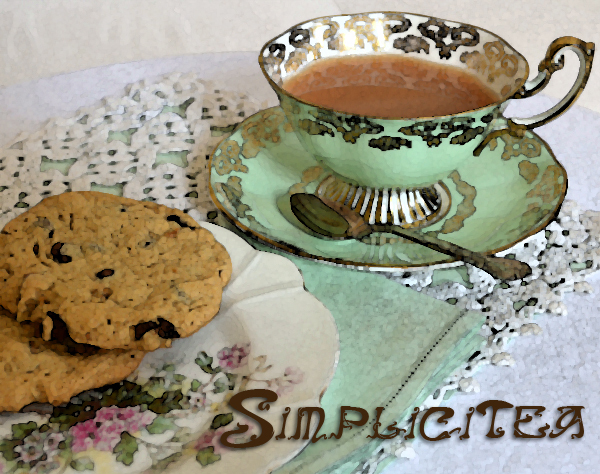 Terri, although I'm not a Tuesday Tea lady, I enjoy your blog posts so much every week. I love the tea cups and treats. Don't you love it when you find a "surprise" image at the bottom of your cup? I have a set of tiny Japanese tea cups and when you hold one up to the light you can see an image of a lady on the bottom. It was created during the cup firing. Enchanting! The book looks to be a wonderful read, and I will have to check it out. Have a beautiful week, sweet friend! 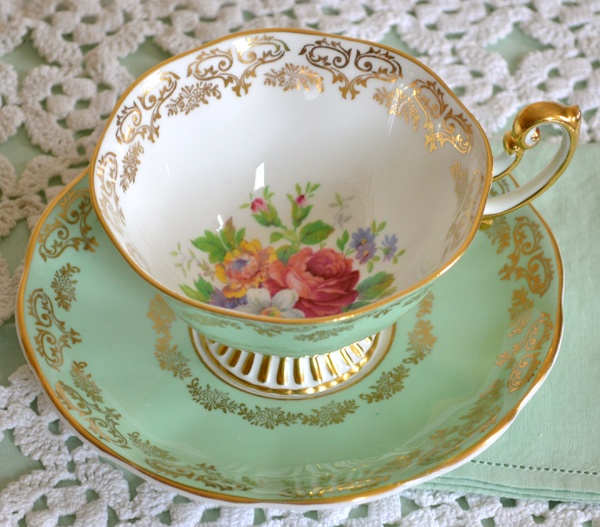 OMG Terri I ADORE that new teacup- that's my favvie fav colour too- gorgeous. Pretty pictures, just brings me such eye pleasure! Oh my..I hope to find a cup like that one day..so magical and charming colors..blissful! What a gorgeous photo journey today..thankyou sweet friend for sharing your enchanting tea time..beautiful!! Blogger is not letting me comment...let's try again. The color of your cup is such a unique green...cool and minty looking. What a find for you! Hi Terri, happy to be linking with you today. I don't do alot of tea posts. I simply adore your new treasure. The color is one of my favorites. Simply gorgeous! Oh how pretty! I love the gold filagree pattern...do you know I've been itching to go to the library...you've just solidified my plans to go this weekend. Thanks! I love your new tea cup and saucer. Such a beautiful cup on the inside as well as the outside and a lovely green color. What another beautiful cup Terri. I have read that book and have enjoyed all her books, Garden Spells is one of my favourite books, I love the touches of magic! Delightful post Terri...I have checked out the novel and it sounds rather intriguing! It seems I can buy it for 1p on Amazon (but pay £2.80 postage :-) Bargain!! That is a beautiful cup! As pretty on the inside as it is on the outside. I love that color, too!